Hope you’re having a nice day, here, yes I’m having a good day, I’m happy because I could finished a new embroidery to share with you all here. Last weeks had been a little busy but looks like I will have more time to do more on my quilts and embroideries in coming weeks. How many times I have seen those three words and never gave them a moment to think about how important a nice and peaceful home can be. Wish age, it become more important things before they weren’t, I can remember now, how many times my elders told me that. Today I can smile to them in my mind, and I could tell them how right they were. With latest news around the world, sad news, it is more important to me to find peace and good moments around me, they don’t need to be big ones. Just a moment of peace at home, maybe a walk around the back yard, see how one by one every flower plant had share with us their beautiful flowers and sharing our yard with some small wild creatures (a skunk, a racoon, and some wild domestic cats) makes my little log house a Home Sweet Home. This time I would like to share with you all, this little embroidery free pattern. 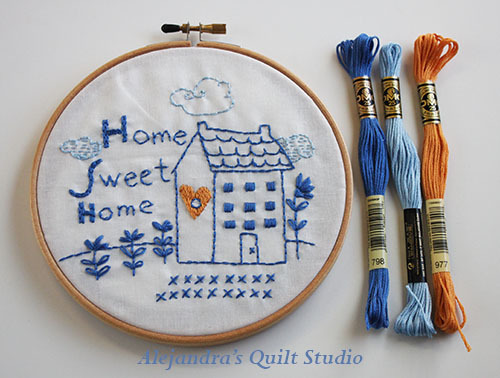 This Home Sweet Embroidery is perfect for beginners to advance embroiders and quilters. You will need to download pattern and print it out, then you can trace pattern on your fabric with a pencil or a marker for fabrics, with the help of a light box or a window. You need to place the fabric on the loop to embroider. Once you finish to do the embroider, you need to take the fabric out the loop and iron gently with warm iron on the back of your work, then trim the fabric making a 8 x 8 inches circle. Place back your embroidery on the loop, and make a running stitch all around on the edge of the fabric, I use to do this stitch with 100 % double polyester thread, when I reach the point where I started, I pull the thread to gather fabric, then I finish it. I place the batting fabric circle inside the loop on the back of the fabric, I do this, to give some support to the embroidery, sometimes fabrics are so light you can see through it, with batting fabric on the back, embroidery will look better. With the 8 x 8 cotton fabric, I also make a circle of it, I place it on the back of the loop, and with little stitches with a single thread, I sew it on the back, to make a fine finish of my work. I hope you enjoy the moment while you do this embroidery. But this time I have a + for you, yes, I know, must of you love to do embroidery, but I have some nice friends who always tell me they are not too good when we talk about embroidery, but they like to keep their home beautifully decorate. This time while I was working to get the pattern ready for you, I thought I might use the same pattern design to make a free printable for you. This Home Sweet Home free printable is a simple one, but hope to help you out to keep your place a Home. I thank you for making the time and read my blog. Free Pattern : click on image to download it.